GR Bagel is a warm, modern Espresso and Bagel Bar in Grand Rapids’ vibrant Eastown neighborhood. Serving Authentic Boiled Organic Bagels made daily, Handmade Cream Cheese, Delicious Sandwiches, Bialys, Cream Scones, a full Espresso Bar with Populace Coffee from Bay City, MI, and Oregon Chai and Tea. 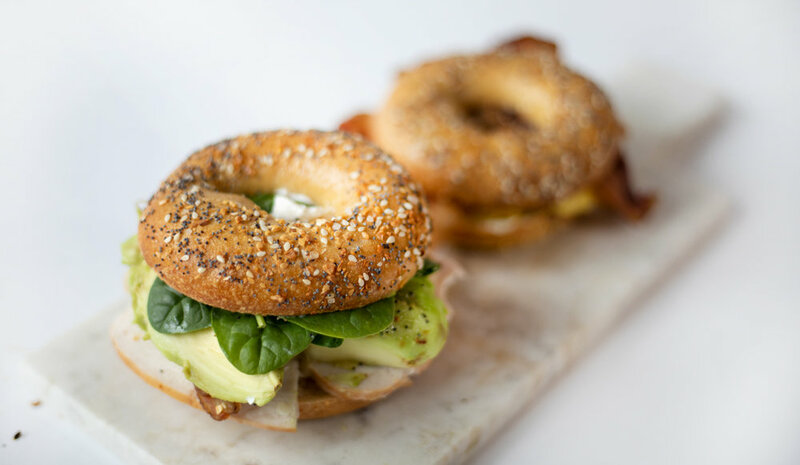 GR Bagel prides itself on sourcing local & organic ingredients, whenever possible. Flour, seeds and grains are sourced organically. Dairy products are sourced from Calder Dairy, MI. Michigan Eggs and Local Raw Honey are sourced through FarmLink, and Sausage from Crane Dance Farm. Made from Natural Milk from Calder Dairy, Michigan. Premium Nova Lox for Parties! Michigan eggs cooked on a griddle with organic olive oil or avocado oil. Local Crane Dance Farm sausage and Nitrite free bacon. Walk-ins for Baker’s Dozens welcome on Saturday and Sunday, and come early!